I followed through as advertized (above) earlier today. 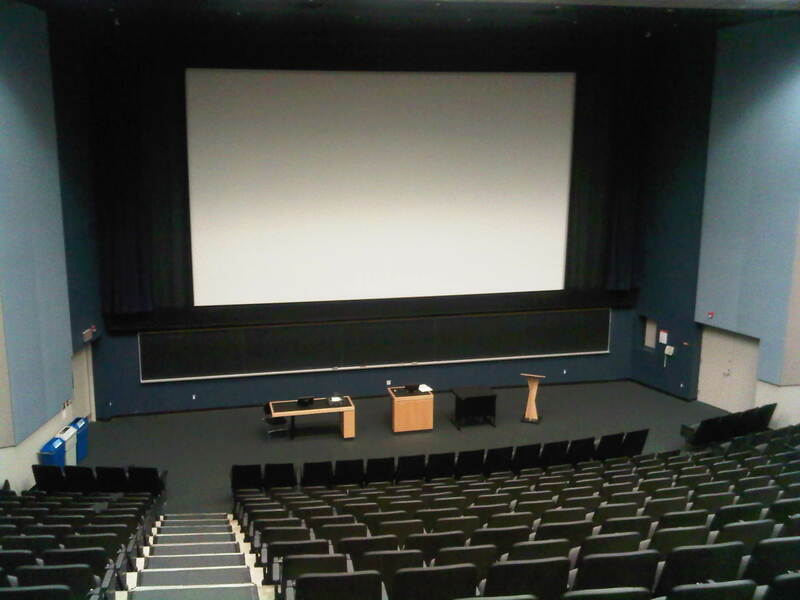 The visual aspects of the pencast are quite acceptable – This is true even in large lecture halls such as the 500-seat Price Family Cinema at York University (pictured above) in Toronto, Canada where I am currently teaching. I used landscape mode for today’s pencast, and zoomed it in a little. A slightly thicker pen option would be wonderful for such situations … as would different pen colours (the default is green). The audio quality of the pencasts is very good to excellent – Although my Livescribe pen came with a headset/microphone, I don’t use it. I simply use the built-in microphone on the pen, and speak normally when I am developing pencasts. Of course, the audio capabilities of the lecture hall I teach in are most excellent for playback! One-to-many live streaming of pencasts works well – I streamed live directly from myLivescibe today. I believe the application infrastructure is based largely on Adobe Flash and various Web services delivered by Web Objects. Regardless of the technical underpinnings, live streaming worked well. Of course, I could’ve developed a completely self-contained PDF file, downloaded this, and run the pencast locally using Adobe Reader. Personal pencasting works well – I noticed that a number of students were streaming the pencast live for themselves during the lecture. In so doing, they could control interaction with the pencast. Anecdotally, a few students mentioned that they appreciated the pencast during the break period – my class meets once per for a three-hour session. Previous approach – Project an illustration taken directly from the course’s text. This is a professionally produced, visually appealing, detailed, end-result, static diagram that I embedded in my presentation software (I use Google Docs for a number of reasons.) Using a laser pointer, my pedagogy called for a systematic deconstruction this diagram – hoping that the students would be engaged enough to actually follow me. Of course, in the captured versions of my lectures, the students don’t actually see where I’m directing the laser pointer. The students have access to the course text and my lecture slides. I have no idea if/how they attempt to ingest and learn from this approach. Pencasting – As discussed elsewhere, the starting point is a blank slate. Using the pencasting technology, I sketch my own rendition of the illustration from the text. As I build up the details, I explain the concept of stability analyses. Because the sketch appears as I speak, the students have the potential to follow me quite closely – and if they miss anything, they can review the pencast after class at their own pace. The end result of a pencast is a sketch that doesn’t hold a candle to the professionally produced illustration provided in the text and my lecture notes. However, to evaluate the pencast as merely a final product, I believe, misses the point completely. Why? I believe the pencast is a far superior way to teach and to learn in situations such as this one. Why? I believe the pencast allows the teacher to focus on communication – communication that the learner can also choose to be highly receptive to, and engaged by. I still regard myself as very much a neophyte in this arena. However, as the above final paragraphs indicate, pencasting is a disruptive innovation whose value in teaching/learning merits further investigation. This entry was posted in Blended Learning, Canada, Commercial Software, Digital Media, Disruptive Innovations, Google, Higher Education, Innovation, Internet, NATS 1780, Online Learning, Ontario, Pencasts, Presentation Skills, Science, Teaching and Learning, Toronto, User Interfaces, Web, Web Browsers, York University by Ian Lumb. Bookmark the permalink. Could a smartpen be used to give a live lecture while away at a conference? For example, could I write my lecture on smartpaper while travelling in France and have my writing appear on the screen in my classroom in the US? And could this be done in conjunction with something like skype so that both sides could hear each other talking? This is a math graduate class so they don’t need to see me, only my “chalkboad” writing. If this is possible it could also be used for one-on-one remote collaboration. Now we use things like document cameras (in expensive video conference rooms), or aiming laptop cameras at pads of paper or chalkboards. Neither is completely satisfactory.